Rolls-Royce plc has signed a contract for the delivery of its highly efficient Azipull propulsion and control system for the 'ferry of the future', a new vessel which will operate on battery power alone. The vessel is being built at the Fjellstrand yard in Norway, and once in service will be operated by Norwegian transport company Norled between Lavik and Oppedal. In 2010, the Norwegian Ministry of Transport announced a tender to develop a new ferry that was 15 to 20 per cent more energy efficient than existing vessels. The Rolls-Royce Azipull propulsion system, which utilizes pulling propellers as opposed to conventional azimuth thrusters will help the battery powered, aluminium catamaran meet these standards. 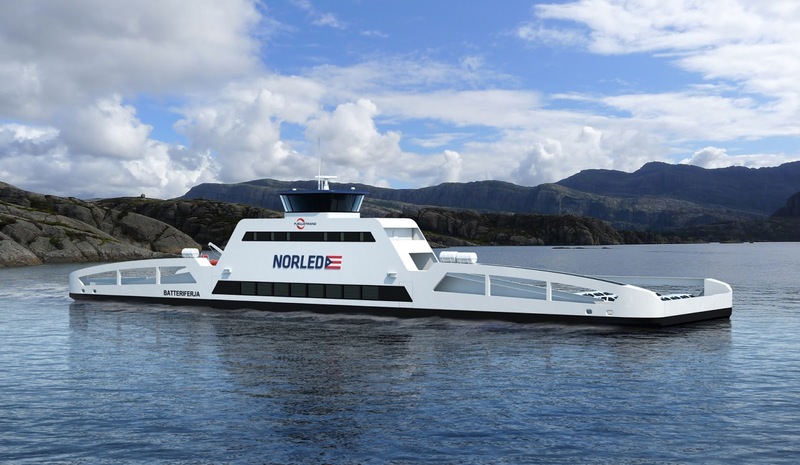 Neil Gilliver, Rolls-Royce, President - Merchant said: "The combination of good manoeuvrability and reduced energy consumption provides a highly efficient ferry for Norled, with significantly reduced operating costs and improved environmental performance. This contract also marks the tenth anniversary of the delivery of our very first Azipull thrusters, which was also to Fjellstrand shipyard." The vessel currently serving this route uses on average one million liters of diesel a year and emits 570 metric tons of carbon dioxide and 15 metric tons of nitrogen oxides. 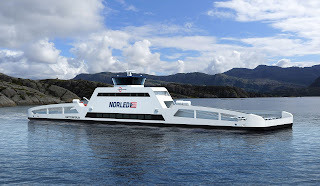 The electrically powered ferry was developed for submission to a competition organized by Norway's Ministry of Transport. As a reward for winning the competition, the shipping company Norled has been granted the license to operate the route until 2025. The ferry has been specially designed to accommodate the requirements of an electric drive system. As a catamaran with two slim hulls, it offers less resistance in the water than a conventional vessel. Furthermore, the hulls are made of aluminum instead of steel, which is conventionally used. Rather than a diesel engine, the ferry is equipped with electric motors to drive the ship's two screws. These motors are powered by a battery weighing 10 metric tons. All in all, the new vessel weighs only half as much as a ferry of conventional design. This saving has a direct impact on the specifications of the drive system. Whereas the ferry currently serving the route has an engine with an output of 1,500 kilowatts (kW) or more than 2000 horsepower, the battery in the new vessel will have an output of 800 kW. In normal conditions, operating at a speed of 10 knots, battery power of 400 kW will suffice. The crucial feature of the new ferry is that it only takes 10 minutes to recharge the batteries. In the two small villages linked by the ferry, however, the local grid is not equipped to deliver such a large amount of power in such a short space of time. To deal with this problem, batteries have been installed at each port.